Speech Language City: Back to School! Happy BTS to all! I'm writing a quick post to give you some useful first week materials. During the first week schedules are nuts but I still try to pull kids to my room. 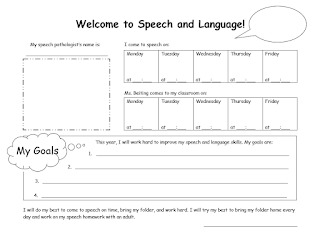 All of my students get their speech folders, check out my office, and complete this worksheet with their speech times and goals for the year. I help the younger ones complete it and the older are able to complete it with more independence. The completed worksheet goes right into their speech folders! Here are some additional freebies to help get your speech folders set up! Hope you all are having a wonderful start to the school year!